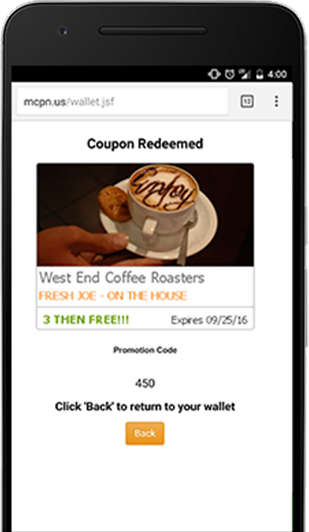 Our unique mobile coupons feature allows business owners to easily create custom one time use mobile coupons within seconds that can be added to each consumer’s personalized wallet. Create a coupon from scratch or use our template to create a custom coupon. Send a blast of coupons to your customers at a time of your choosing. Reward all your customers who opt-in with a special bonus. Our built-in redemption feature that includes automated barcode creation and promotion code development will make it easy for any business to succeed. 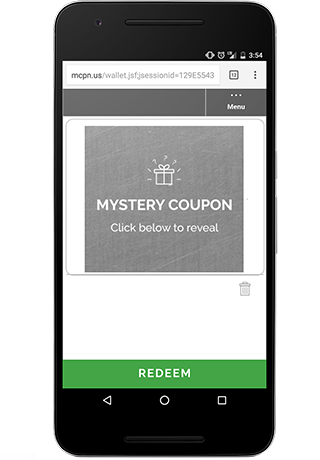 Mystery Coupon will have a top layer image covering its content. Your customer will then have to scratch off the top layer in order to reveal the coupon’s offer. This fun and effective process will surely grasp the attention of any and all potential customers’ for any business. Our reporting tool enables the business owner to track open, deletion, and redemption rates simply and effectively. Sign Up to Get Instant Access Today!